Penelope from Penelope Jane Cakes did an amazing job on our wedding cake! She was very professional and very responsive and made it very easy for us to work with her. Her prices are fair and competitive for what research we did in the Napa area. Most importantly, the cake looked and tasted exactly how I expected. And it was delicious! She gave us a lot of flexibility with designing our cake and choosing the flavors. We were able to do two flavors in one 5-tiered cake. Our favorite (and a big hit with our guests) was the chocolate cake with a Cabernet sauce and cherries. It was perfect for our outdoor winery estate wedding! She even matched my wedding color in the ribbon bands (made of fondant) on our cake! She also incorporated a cake stand I wanted to use with no issue. Everything came out just as we discussed and it arrived on time at our wedding venue. Penelope truly went above and beyond to make us exactly what we wanted and I'd highly recommend her. Overall, I was very happy with our wedding cake. My husband even commented on how much he loved it and typically that stuff goes unnoticed with him. the cake tasted great and was completely photo ready. we didn't have many ideas for our wedding cake, it was all base on what Penelope thought would fit with our wedding flowers and colours. we loved it! Our cake was FANTASTIC! And that is an understatement! Penelope Jane made us an unbelievable vanilla cake with raspberry filling, lemon custard and white chocolate buttercream frosting (if your mouth is not watering now you are not human!). When we tasted it we about passed out it was so good. We cannot wait to have the rest on our first anniversary! We had ordered flowers to go around the cake and for some reason they didn't show up. Penelope was so great! She went out into the garden where we were having the reception and picked some petals herself for the decoration! She saved it completely. She was friendly, easy to work with, on time, VERY helpful and the cake was the best cake we had ever tasted in our lives! You will LOVE your cake if you choose her company! I had the pleasure of meeting Penelope at a Bridal Fair and got to taste her exquisite cakes!!! We set up a meeting with her a few weeks after that and booked her immediately. Not only was our cake delicious it was above and beyond whatIi had imagined!!! We custom designed our cake and she did an outstanding job!!!!! She truely is very talented and everyone raved about our cake!!! i HIGHLY recommend her as a vendor! She's worth every penny!!! I cant wait to eat her amazing cake again in a year when we have her make another little cake for our anniversary!!! Thanks so much Penelope it was a pleasure working with you!!!! Penelope makes the most delicious, dense, moist, flavor-packed cakes. My daughter had three flavors for her wedding and all three were exceptional; we opted for buttercream icing which was a perfect complement to her cakes. Her cakes are prepared with local, fresh ingredients and that really comes out in the flavors. Our guests couldn't get enough! As the MOB I also appreciated Penelope's always timely responsiveness, professionalism, and flexibility. Having visited at least 5 wedding cake vendors in that geographic area, I can say without a doubt that Penelope is one of a kind! I planned my wedding in Napa from New York and did everything over the internet. My only concern was how good the cake was going to be. Since I couldn't do a tasting I had to go on the hotel suggestion - AMAZING! Truly a delight to devour over our honeymoon (just as good on day 4 as it was on the wedding day!) The lemon was so rich and lemony - just as I wanted it! If you are considering Penelope Jane, look no further, you won't be disappointed! Penelope Jane cakes and treats are the best in the Napa Valley - She recently catered a large holiday party at our winery and she was amazing. She also created wonderful holiday truffles from our cabernet to give as holiday gifts - rave reviews from all - I highly recommend her and her cakes and truffles - Yummmm!!! Penelope walked us through our cake tasting and choosing experience (one that we were not convinced we wanted to do!) that we ended up having one of her fabulous carrot cakes along with some of her chocolate truffles at our dessert table. She was also able to deliver and work around a raging California wildfire that threatened to ruin our reception and destroy her cake! Enjoy working with Penelope and buon appetit! Penelope was fantastic! She is undoubtedly talented but also very professional and easy to work with. Her input and ideas really helped my fiance and I create the perfect the cake that we both loved for our Napa Winery themed wedding. Our three-tiered square cake was beautiful, but most important to us- it was absolutely delicious! Penelope also prepared two kinds of dark and milk chocolate truffles for our guests at the end of the reception, and everyone loved them! Penelope was very mindful of the budget we had to work with, which we greatly appreciated. Beautiful cake, delicious taste, satisfactory service, preferential prices. What to say? Penelope Jane is the perfect wedding cake vendor to choose. Our wedding was a destination wedding to Napa so we were only able to meet her in person once, but everything was perfect. 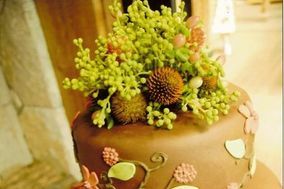 From the wedding cake with wine grapes to the grooms cake that was chocolate and port soaked cherry Canon 5D camera - She is AMAZING!! Penelope is the best. Our cake was look and taste amazing. She keeps in contact and knows what she is doing. Very easy to talk too. I am going to ask her to another cake for my son first birthday. The cake Penelope made for our wedding was beautiful, but more importantly, it tasted soooooo good!! We had three layers of different flavors, chocolate with port soaked cherry filling, lemon with lemon curd filling, and Italian creme cake. I made sure I tasted each one, and they were all fabulous. She also made a beautiful tray of chocolates, tarts, and biscotti. Penelope was so kind and so professional. I highly recommend her for all your dessert needs. Tasted great! Looked amazing! Everyone was in awe! Penelope makes the most beautiful and delicious tasting wedding cakes! In addition, Penelope also made 2 different flavor biscottis, and 3 different cookie favors for our wedding. The cake was very delicious and we received many compliments about how good it was. All the biscotti and favors were gone by end of the night, we didn't get to taste them! She was very professional, so nice to work with and delivered a superior product. I would highly recommend her to anyone looking for a cakemaker. Penelope was so easy to work with. I know nothing about wedding cakes but she was able to help walk me through the process. I was able to tell her what I did and did not like and she created a beutiful cake...her cakes look like they're right out of Martha Stuart Magazine! And they taste good too! Penelope provided a beautiful and delicious dessert bar for my daughters wedding.. The cupcake tree was fabulous and beautifully decorated. From the truffles to the chocalate covered strawberries....this table was the hit of the night!. She delivered and decorated right to our expectations! We loved it all!!! Penelope Jane Wedding Cakes was just what my finance and I were looking for! Penelope was very personable and professional. We were thrilled to see our cake when we enter our reception, the cake was gorgeous, absolutely perfect! and it tasted delicious! Our cake was fabulously tasty! And it was beautiful. Penelope did a great job making exacty the cake we asked for. I would definitely recommend her to other couples. Penelope was very sweet and helpful! The cake was so delicious and pretty, i basically left the decor up to her and she did such a good job. I wanted something simple and every one loved it. I definitely recommend her! !